Dell has quietly listed a Google Android 2.2 Froyo running smartphone - Dell Venue at the Dell India website. Dell Venue smartphone seems to be inspired from the Dell Venue Pro running Microsoft Windows Phone 7 mobile OS. Venue has 4.1-inch 24-bit AMOLED display and offers 8 megapixel camera to capture high quality images and videos. The phone was launched was worldwide last week but we didn't expect it to appear so soon on Dell India website. Unfortunately there's no mention of pricing at the website but considering it's Korean price of 700,000KRW, we can expect to be priced at around Rs. 30,000 approximately. Back in Oct we reported about Dell Venue hitting FCC labs and honestly didn't expect to appear for India before the end of the year. Dell Venue is apparently the Android cousin Dell Venue Pro which is WP7 based full QWERTY slider. Venue will run Google Android 2.2 Froyo by default and of course will have Dell Stage UI layered on top of it. Dell Venue sports 4.1-inch AMOLED display with Gorilla Glass technology and supports 800x480 pixel resolution. Inside the smartphone chassis lies the 1GHz Qualcomm Snapdragon QSD8250 microprocessor that promises faster performance with 512MB RAM and 1GB ROM. With that hardware power packed inside, we can expect the Android 2.2 Froyo to be snazzier and faster. Though the Venue offers 1GB on-board storage, you can always add up to 32GB microSD card to it. Venue supports quad-band GSM network and promises HSDPA with up to 7.2Mbps download and HSUPA with up to 5.76 Mbps upload speeds. For powerful imaging, Dell has packed 8 megapixel camera with autofocus, 4x Digital Zoom, and geo-tagging. Yes, it does have LED Flash unlike the Samsung Galaxy S. You can also record 720p HD video with this smartphone but won't be able record it in 1080p HD since the 1GHz Scorpion CPU's limitations. Dell has put a dedicated camera key for capturing images and recording videos. Watching videos on the 4.1-inch AMOLED screen certainly would be fun and the phone supports H.264/MPEG-4 AVC and WMV video codecs. Plug in your favourite pair of earphones in the 3.5mm audio port and you're good to go for hours of music. Or you can get a Bluetooth A2DP headset since the phone has Bluetooth 2.1+EDR module on it. Better email messaging can be expected from Dell Venue since it supports ActiveSync, Push Email, POP3, IMAP and Microsoft Exchange. Venue features Web 2.0 full HTML and WAP supporting browser that will give you decent mobile web experience. Also Flash Player 10.1 support adds more fun web browsing. You can also browser web faster using the Wi-Fi (802.11 b/g/n) support on the Venue. Location based services apps can be used as the phone has GPS module and also has E Compass. 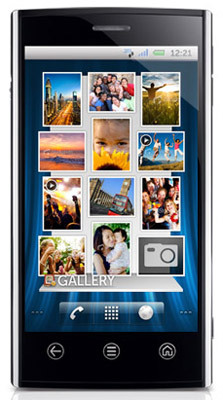 This smartphone also has accelerometer than can be used with several apps. Packing 1400mAh battery we hope that this phone offers good 4.5 hours or more talking time on it. As of now there's no official word of release in India. Stay tuned for more details on its availability and pricing.